Ah, Android Lollipop – one of the biggest updates since Google's OS was born. Naturally, after its release in October, all manufacturers are racing to update at least their flagship to the new system – an important move, if cellphone makers wish to show their customers that their devices are future-proof, ergo – worth investing in. Samsung, being among one of those manufacturers, has already started rolling out updates for its Galaxy S5 flagship, and solid leaks point to the Galaxy Note 3, Note 4, Note Edge, and Galaxy S4 all being in line for the Android 5.0 update. We've also seen some videos, showcasing unfinished TouchWiz builds on the Galaxy S4, Galaxy S5, Note 3, and Note 4. Now we hear that Samsung is already working on Android 5.0.1 updates for the Note 4 and Note Edge, which most probably means that the two phablets will skip the 5.0.0 update. The rumor comes from SamMobile, which is generally pretty reliable when it comes to Samsung leaks. No cause for alarm yet, though, as this will probably have minimum impact on the updates' rollout schedules. Latest rumors talk about the Note Edge and Galaxy Alpha getting Lollipop some time in February, and we'd wager that this is when the Note 4 should be getting it, too. Are you anxious to see Lollipop TouchWiz? We sure are curious to see how much Material Design Samsung decides to intertwine with its own interface. Hardly the case, most consumers don't know there is even an update called Lollipop. They don't visit mobile news sites and just use their phones. A lot of tech savvy users don't care either, they're running custom roms. And for most api's, the Android update isn't important. The Google Play Services updates are. Exactly! Android OS had gotten so mature that updates are nice but not necessary. I use to wait anxiously for updates but now I'm fine with Kit Kat. And if I get bored with it, I'll just download a custom rom on it. That is true. My wife's Nexus 7 (2013) had the Lollipop and 5.0.1 update and she still did not update it (never noticed to update available on her notifications LOL) and I had to update it for her. Most average Android users don't know/care for updates, as much as the average iOS user as well as I see many of my coworkers on old iOS versions. For iOS, customers begging for downgrade. Thing is iOS users get a bad version, few days after its fixed, android gets bad version 90% of its phones get stuck for months on it.B**ch please! That's just it, with Android your never stuck. You can always go back to the previous version. Because when iOS needs an update it makes the broken feature totally unusable, while on Android we can just download a work-around. All OS' have broken things or bugs. But in the case of the iPhone, they have to be fix right away because you won't be able to use it until they do. There hasn't been a bug in Android that broke every single Android model sold. It usually only effects a particular brand and they do fix them quickly. Samsung has had issues and instead of blaming the user they fix them right away. I cannot wait anymore! Faster samsung, release the update. 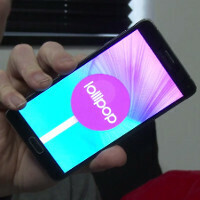 I doubt it that we will wait for February to get Lollipop on our Note 4 units. I believe it will be released by the end of this month or within the 1st week of January. Probably because there are like 10 times s5 than note 4 out there. The Galaxy S series will alway be the number 1 flagship for Samsung, which is understandable since it sells much much more than the Note series. Just because the Note packs better specs doesn't mean it is the main flagship, it will pack better specs because it is usually released 4 months after the S series. The iPhone 6+ packs the better specs compared to the iPhone 6, but the 6 remains Apple's favorite. It packs better specs because it does more than the S. The previous Note like the original and the Note 2, were basically the S with a bigger display and the pen. The 3 and 4 are very different from the S that were before them. The S5 is the flagship, the note is a niche device. Maybe because the S5 was released before the Note 4? Could that be it? No, simply because it is the main seller. Yep! That's the main point with Lollipop. 64bit on ART. The rest is on your artist feeling. the new exynos is really beast processor its speed is unbelivable non laggy they threated the thermal issuses of the previous versions(mostly) its really uncomparable. Exynos 5422 from Galaxy S5 had no thermal issues. But I agerr, Galaxy S4 (i9500) is hot.